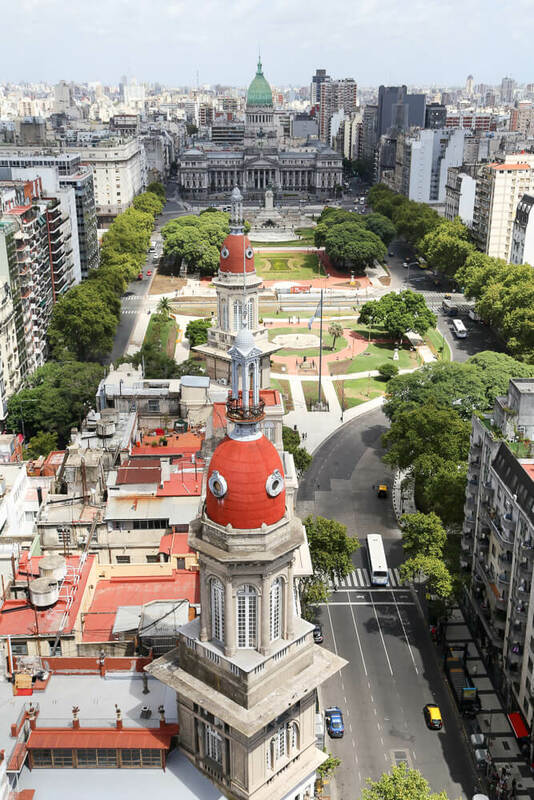 A walk down Avenida de Mayo is essential for any visit to Buenos Aires. This street is full of beautiful architecture, you may just experience love at first sight in Buenos Aires with a stroll here. The avenue is not only beautiful and very reminiscent of Europe, it's politically symbolic. 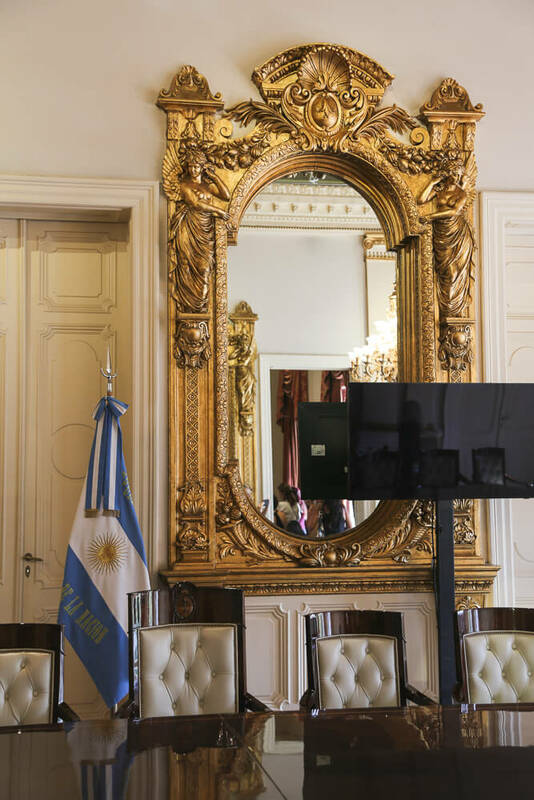 It connects the executive government house (the famous Casa Rosada) and Congress. New presidents travel down Avenida de Mayo after being sworn in in Congress to the Casa Rosada on the first day of their presidency. Many a protest walks down Avenida de Mayo taking their complaints from Congress to the president. Follow their steps on your own walk down this infamous avenue with this self-guided walking tour of Avenida de Mayo. Begin in front of one of the most impressive buildings in the city, the National Congress. You can get here with the subte Line A to the Congreso stop. Construction began on the palace in 1897 and the building was finally inaugurated in 1906 but not without drama. The original architect, Vittorio Meano was murdered in his home in 1904. Belgian architect Julio Dormal finished the project, respecting the original plans. The building was dubbed the "Golden Palace" by journalists due to the budget-busting costs, ringing up to over 31 million pesos in 1914. 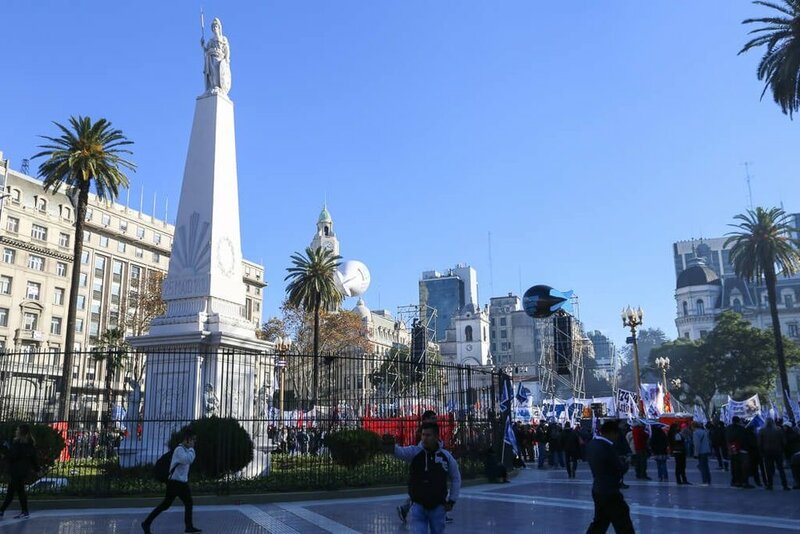 After admiring the costly Congress, take a stroll through the Plaza del Congreso towards Avenida de Mayo. All roads begin here. The zero kilometer marker for all of the country's highways is located here. And one of the bordering streets, Rivadavia Avenue, actually divides the city in two. The roads branching off of Rivadavia have different names on either side. So you can take Callao to get to Congreso, but once you cross Rivadavia you are now on Entre Rios Avenue. Look for Rodin's The Thinkerin the center of the square, the third of only eight original casts made. Walk through the square until you're at Avenida de Mayo, walk a block to Palacio Barolo. 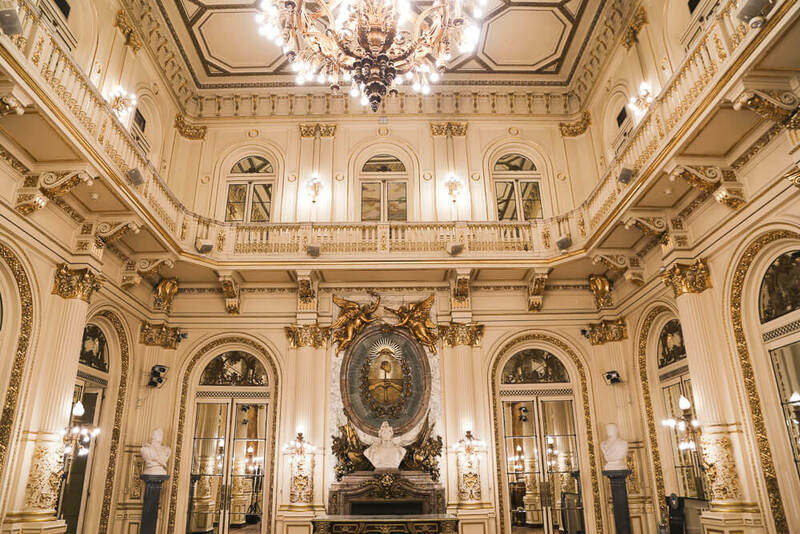 At Avenida de Mayo 1370, you'll find Palacio Barolo. The building was designed by the architect Mario Palanti and financed by Luis Barolo, both Italians. The building is loaded with symbolism from Dante's Divine Comedy. The ground floor gallery is hell, filled with demons holding light fixtures and 9 arches representing the nine circles of hell. Floors 1-14 represent purgatory and 15-22 is paradise. Book a tour here. The tour is REALLY worth it, if only for the view (one of the best panoramic views you'll find of the city). After exploring Palacio Barolo stroll down Avenida de Mayo until you get to 9 de Julio, the worlds widest avenue. The avenue is named after Argentina's Independence Day: July 9, 1816. The avenue is widest in the world with 7 lanes going in each direction, however, it's only about 1 kilometer in length. You can take a quick detour to the obelisc from here if you'd like. Rest your feet with a coffee break at Cafe Tortoni at Avenia de Mayo 825. Open since 1858, stepping into Tortoni is like traveling back in time. Sit in the same cafe as Jorge Luis Borges and Julio Cortázar to enjoy a cortado (coffee with a splash of milk). 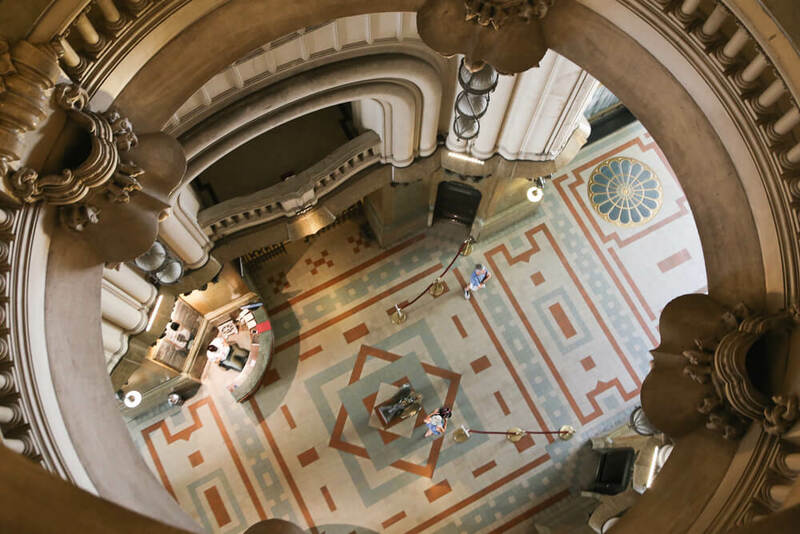 Look up at the Tiffany glass ceiling and explore a bit, taking in the decoration. You can even visit at night for a tango show. Slowly stroll down the next three blocks to Plaza de Mayo. Enjoy the tree-lined sidewalks and the gorgeous architecture, don't forget to look around. The architecture here is impressive! At Avenida de Mayo 767, step into the El Tunel bookshop. Buenos Aires is FULL of bookshops. People here love to read, and contrary to the US where bookshops are closing at a rapid rate thanks to e-readers, bookstores here are thriving. Duck into El Tunel to hunt for treasure amidst the piles and shelves and boxes of books. Leather bound or paperback, you're sure to find something to bring home. When you arrive at Plaza de Mayo, on your right you'll see the Cabildo. The Cabildo was the center of the Spanish Government during colonial days. The original adobe structure was built in 1580, and the white stucco building you see today is from 1810. Take a left to go to the Metropolitan Cathedral. When you reach the corner of the square, you'll cross Avenue Diagonal Norte with a great view of the Obelisc on 9 de Julio. It may look more like the Pantheon or a Greek temple, but this is the main cathedral of the Catholic Church in Argentina. There has been a church on this location since 1593, under orders from the city's founder Juan de Garay. After 7 re-builds, the current structure we see today has been there since 1752. 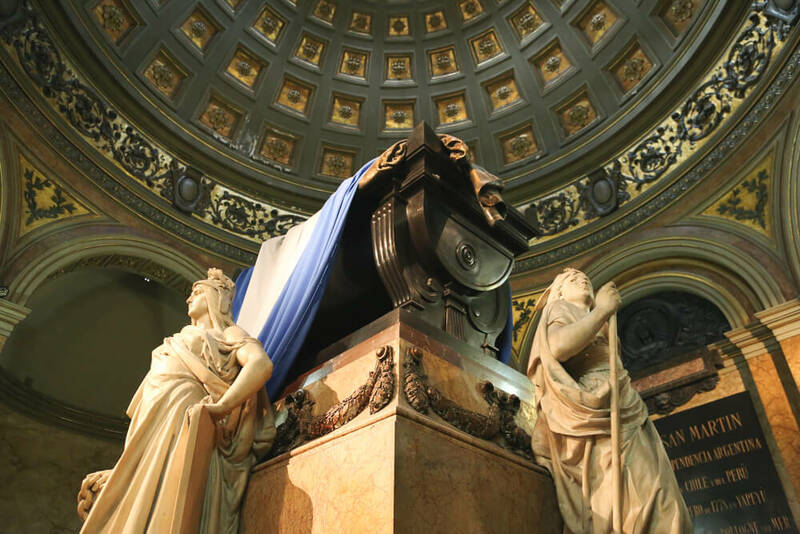 Outside the entrance burns the eternal flame for the unknown soldier and General San Martin. In the third chapel to the right of the central nave, you'll find the mausoleum of General San Martín. 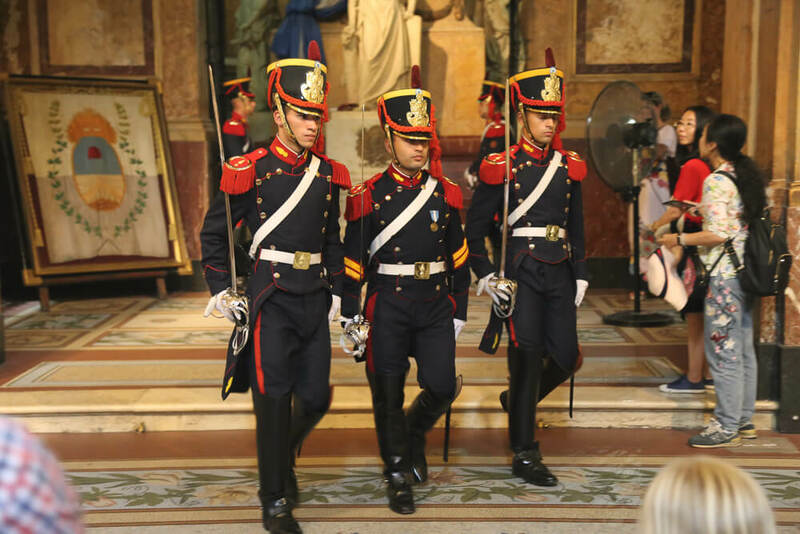 The three women standing guard at the base represent Argentina, Chile, and Peru: the three countries liberated by San Martín. There are two soldiers, grenadiers, standing guard outside the entrance to the chapel. We were lucky enough to catch the changing of the guard at 3 pm. 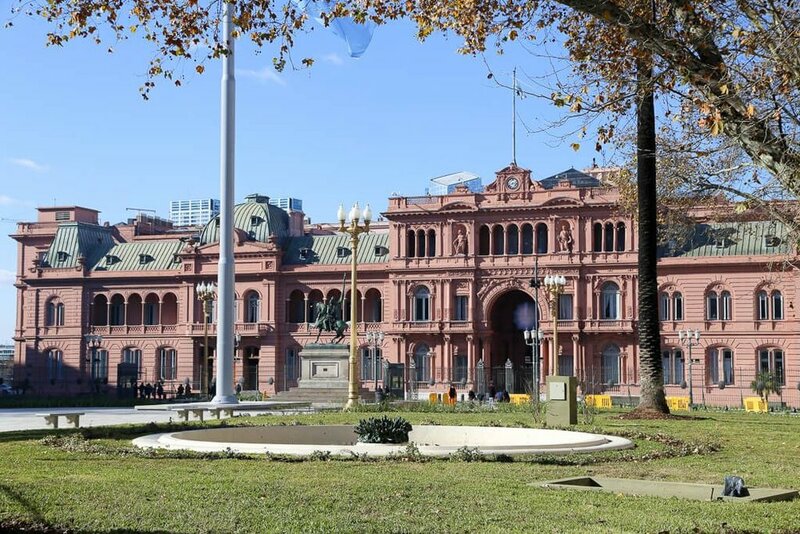 The Casa Rosada, or the pink house, is the official government building, the "Argentine White House." The president doesn't live here (they have an official residence in the northern suburb, Olivos), but this is where the magic happens. Where they work every day, and where Madonna as Evita tell Argentina not to cry for her. Guided visits are only on weekends and holidays from 10-6. They're free, with 2 English tours at 12:30 & 2:30. Reserve yours ahead of time here, bring your passport. No one knows for sure why the building has always been painted pink. Two main theories include political parties and lard. The first being that the two colors of the main political parties blended together to create pink. The second referencing the proximity to the river. To protect the building from humidity a mixture including lard was painted onto the walls, and that lard had traces of blood in it, hence the pink tones. These are just stories and theories though. Thanks for taking this walking tour of Avenida de Mayo with me! Now where to? From Plaza de Mayo you can take Defensa Street to explore San Telmo. If it's a Sunday you should go to the San Telmo Market. You can continue walking past the Casa Rosada for a walk by the water in Puerto Madero. If you're enjoying the museums and architecture and want more of that, then I recommend visiting the nearby Kirchner Cultural Center located in the city's original post office. Or hop in a taxi to La Boca! Whatever you choose, definitely end the night with a steak and a glass of Malbec. Follow the map below to see where all the stops are and to better plan your day.